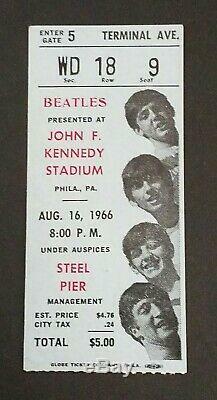 Beatles JFK Stadium Concert Ticket stub from 1966. 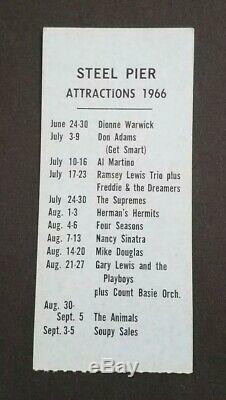 Twenty-one thousand people attended this August 16th 1966 performance in Philadelphia, roughly one-third of the venue's capacity. To make matters more frustrating for the band, the show was threatened by a thunderstorm throughout the night. Fortunately, the rain held off until just a few minutes after the show ended. This blue ticket stub from the show is in good condition. The item "Beatles 1966 JFK STADIUM PHILADELPHIA CONCERT TICKET STUB Blue, JFK STADIUM" is in sale since Monday, February 18, 2019. This item is in the category "Entertainment Memorabilia\Music Memorabilia\Rock & Pop\Artists B\Beatles\Concert Memorabilia".